The iOS 7 software update brings many changes to the messages app. One of those changes is how sent or received times for text or iMessages are viewed in the stock messages application. The process is quite simple however could be tricky to find. Since iOS does not indicate how to do this it is most likely that you will find this iOS 7 feature accidentally like I did or when someone else tells you about it. 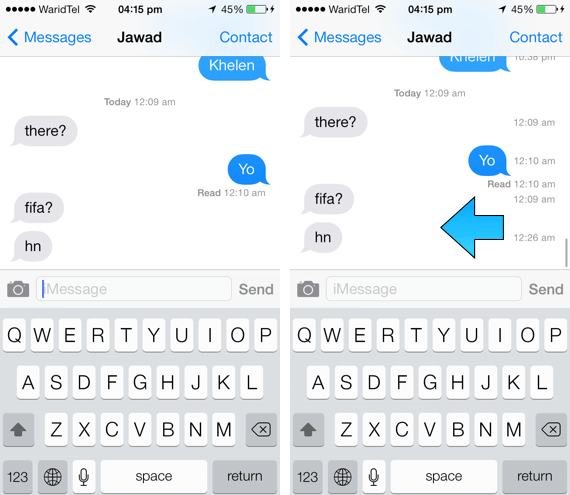 To view the timestamps of any messages thread in iOS 7 just open the relevant thread and then swipe towards the left side of the screen. This will reveal the time for each message whether it was sent by you or your friend. Remember that time will appear on the right side of the screen for both sent and received messages. You will have to hold in order to keep the timestamps appearing. The moment you release the time will disappear and thread will go into its original state. It is a handy little tip that can be very useful at certain occasions. Here’s another iOS 7 messages app related tip that you might not be aware of.